Hi, would appreciate some help regarding my issue in the subject line. Its a completely stock UK ( English ) Honda Accord 2008/9 EX GT with Navi. ( Diesel, Turbo) , stock entertainment are made by Pioneer ( not Alpine/Clarion .... I got to know this when I lost my keycode and went to Honda for a re-issue ). The premium sound system worked well till lately, when the front speakers would quit working after about 4 minutes after switching on the car and start driving. Even If I don't drive, and just listen to the radio, at low volume, the front speakers will quit after the same time. Lately, the 'quit time' shortened to around 1 minute or less. As a result of this malfunction, now even the in-car generated info, phone bluetooth, fasten seatbelt warnings,etc.....have stopped working...or let me re-phrase....are not heard anymore as soon as the front speakers quit. The reason, is that these messages are fed only to the front door speakers. What still works ? > the centre speaker, the two rear door speakers, the rear shelf speakers, and the subwoofer. All other posts I have researched seem to not deal with the circumstances I describe. BTW.. All speakers do have continuity check, and work well without issues. I have checked each speaker independently, by connecting it to a spare stereo head unit. So... no problems with speakers themselves. If someone has the schematics of the amp and head unit, and also can point me to the location of the amp, I will attempt to fault find. I am a certified electronics engineer, and can handle deep SMD repairs at component level. However I would like to be prepared with info first. Last edited by GeorgeM; 10-13-2013 at 07:41 AM. bummer of an issue. finding schematics will be very difficult, i haven't seen any for OEM stereos or amplifiers. if we think about what the front channels have going on, we know that there is a preamp-level mixer that combines all of the chimes, BT, audio, etc. before amplification. so the problem is either in that mixer or in the actual amplifier outputs. that means you are looking at the external amplifier itself and not the various components that connect to it. the amplifier likely uses an STK pack or other IC-based amplifier chip. you will want to get into the amp to verify what exactly is going on. when i repair OEM amplifiers, it takes a while to verify what each pin is doing - usually with a DMM and/or scope and also visual tracing of wires in the car. usually, there are two harnesses - one is input/power and other is output. i have a set of wires with female pins soldered and color coded and insulated that i can plug into the jacks while the amp is on my test bench. then i can open the amp up and power up and test. since it happens after some time, we can rule out complete component failures and maybe investigate a poor solder joint associated with the mixer's power supply section or the mixer itself. likely as the circuit heats up, the expansion causes loss of signal (it only takes one cold solder joint to cause this type of problem). i use freeze spray to help look for solder joint issues. naturally, you'll figure out what each component/IC is by looking up the datasheet then verifying the pins have proper signal/voltage. Yes...I could try the 'harness extension' method to work comfortably... else bring my scope down to the garage and have a look. Any idea where to locate the amp in the Accord EX GT that I have ? 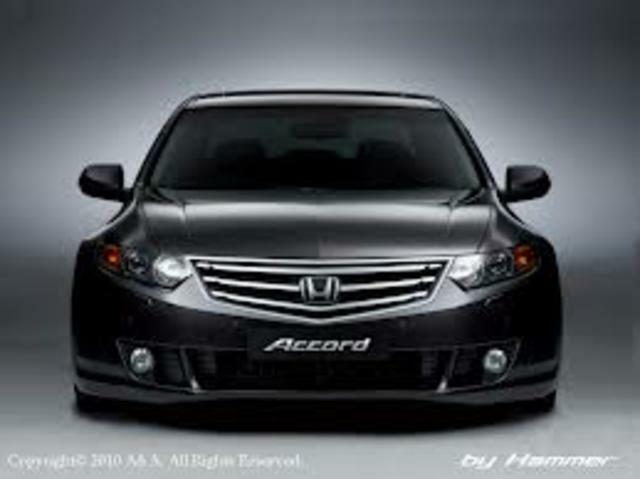 ( I linked a picture of this accord model in my first post ). If anyone can locate the schematics of the OEM entertainment equipment I'd be greatly appreciative. If I manage to fix this, I'll do a tutorial and post here. So... I managed to locate the Amp ( its located at the back of the car, on the right, hidden under the carpeting ). Dismantled the amp, opened it up, and started fault finding. The amp is an 8channel job, based on TDA 7560 chips. One was getting much hotter than the other, so I replaced it. Found out that the tracks on the front speakers are not direct , but passing from one layer to another of the PCB. So I bridged them with wire. Guess what.... the problem still persists. So I must now check the Analog devices 4 chips that are in the signal path. Probably these provide the gain and equalization to the amp. But no datasheets were found for these chips.....must dig deeper. Thanks for any insight which you may provide !! Last edited by GeorgeM; 10-28-2013 at 11:20 AM. if some of the amplifiers are getting hotter, that could mean they are feeding a short. so the problem would be downstream of the amps. at this point, an oscilloscope is used to trace the signal through the preamp and amplifier.